Darren Barefoot just started DearRockers.org, a project that encourages us all to send a few bucks directly to our favorite artists as a little something for the effort in these times of labyrinthine licensing agreements and rights management, and document the transaction on the site. The thought occurred to me that it would be nice to extend a similar gesture to the striking television writers. 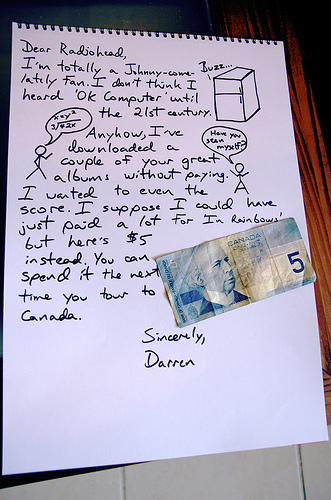 More backstory on Darren’s blog. Thanks very much for the linkage!